In The Bath by Janet Frame we have the theme of loneliness, control, reliance, loss, struggle, mortality and connection. Narrated in the third person by an unnamed narrator the reader realises after reading the story that Frame may be exploring the theme of loneliness. The old woman throughout the story is alone. When she gets stuck in the bath despite calling out for help nobody comes to assist her. When she is placing the flowers on her husband’s grave she is again alone. In fact that old woman is so alone in life that she appears to long for a time when she herself is dead. It is as though life has become one long difficulty for the old woman. She no longer has control over her body. The tasks she would like to perform. Something as simple as getting out of the bath or taking down a pot of jam from a shelf. Are no longer something that the old woman can do with ease. She has to rely on others to assist her. This may be significant as it suggests that time has caught up with the old woman. Yet she is very much alive when it comes to feeling loss. Something that is noticeable by the fact that the old woman tends to her husband’s grave on each anniversary of his death. The past is very much alive for the old woman. Whether she might like it to be or not. Frame also appears to be exploring the theme of struggle. The old woman struggles with every task she performs. She also may struggle with the loss of her husband. Not only emotionally is she still attached to her husband as one would expect a widow to be. But she also relies on him physically. If he was still alive he would be able to help the old woman out of the bath. No longer would she have to struggle. The sense of struggle that the old woman feels would also lead the reader to believe that Frame is suggesting that life may be getting to be too much for the old woman. It is as though she wishes for her life to be over. Which would play on the theme of mortality. If anything the old woman longs to be dead such is the difficulty she incurs in life. Not only is the longing for death driven by loneliness but it is also the fact that the old woman’s body is wearing out. As mentioned she is no longer able to do the things she once was and is reliant on others to assist her. If anything there is no joy in the old woman’s life. Everything is a struggle that is tinged with sadness. It may also be possible that the loss of her husband is just too much for the old woman. Though she attends his grave for his anniversary it is most likely that she is a frequent visitor to the grave. Even though Frame doesn’t give any details as to the type of relationship the old woman had with her husband there is still nonetheless a sense that the old woman loved and continues to love her husband. It may also be significant that the old woman can no longer enjoy the simple things in life (looking at the sky) as this suggests that the old woman may have given up on life. It is as though she has been defeated by her body and the fact that she is alone. Simple things are no longer simple for the old woman. Everything is an effort which may not be worth it to the old woman. She appears to be comfortable with the idea of death. Something that is symbolically noticeable by the fact that the old woman wishes she could fall asleep in the graveyard. 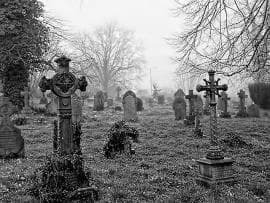 It is as though the graveyard is the only place where the old woman is able to find peace. Also she would be near her husband. The end of the story is also interesting as Frame through her description of the world around the old woman may be suggesting that life goes on regardless. The traffic still moves and people or strangers still have places to go. These observations may be important as it is through them that the reader senses that the old woman is no longer connected with the world. She is a stranger among strangers. It might be true that her nephew will come and stay with her but the old woman still longs to be dead. She sees no positivity in the world and if she does (nephew coming) it is soon beaten down by the negativity that the old woman feels about life. Whether it is the loneliness the old woman feels or the loss of her husband or even a combination of both the old woman does not appear to be enjoying the life she is living. Not only has her body let her down but her mind too lacks any sense of optimism. While many would like to live on forever in life this is not the case for the old woman. Any comfort that the old woman has felt in life is gone. She is alone, beaten and unable to live her life as she would like to. McManus, Dermot. "The Bath by Janet Frame." The Sitting Bee. The Sitting Bee, 17 Sep. 2017. Web. That’s great. I’m glad you found some of the posts on the blog helpful. Hi, can you explain how the bath is aging with the old woman? I would need to read the story again. Though perhaps the bath is the same bath that the old woman had when she first moved into the house. It is as old as the woman herself. Also the characteristics of the bath might be worth looking at. How Frame describes the bath. Why is there theme of control if I may ask? The old woman no longer has control over her body. Thanks a lot you helped me with my studying. I got lots of information now, I will explain the story tomorrow and I am going to remind my students about the theme of this story thanks a lot. Thanks what a great website. Really helped me with my homework. Wow! You covered all the points in the essay approximately…Great job looking forward to that but I have a question (I’m a teacher in Sabis International School). Why does the narrator plan to visit her husband’s grave on Saturday? I’m not sure. Maybe it is his anniversary. I think another theme is of nostalgia. The old woman deeply feels the loss of many things in her life and wishes for them to be restored. When she is in the bath, she wishes for her husband to have been alive, so that they could have helped each other. She remembers the time when she could do things on her own but now has to rely on others to do them for her. For instance, she herself had made the jam and put it on the top most shelf. Now, she needs help to take it down. Again, while she is comparing the graves of her parents with that of her husband there is a yearning for the time when there were wide open spaces, that are taken up by people due to over population. The comparison of the graves may also allude to her own narrowing world. Whereas before, she had freedom of movement, now the space in which she can operate is getting narrower and narrower with time. I think you may be right. I also like the symbolism you point out with regards to the graves. Thanks for the insight. But as I’m reading the story I’ve noticed that the old woman didn’t rely on others for help. For instance, when her relatives tried to help her she refuses. Also, she refuses to live with them and preferred to live alone. It may be a case that the woman is determined not to change her life from what she knows. That she chooses to be alone as you have highlighted. Can you also include text quotations if you write analyses of other stories. That really might help me as I would know which quotations might be actually related to the themes. No problem. I’ll do that. A large part of the story consists of the women’s struggle to get out the bath. How does this help the author get her message across and what might this message be? Some critics might suggest that the struggle the woman goes through mirrors the struggle for equality that many women feel in a male dominated society. Another way to look at it is that the woman relied on her husband and since his loss, feels that she may not have very much to live for. The woman is struggling through out the story and a bath is usually a place where an individual would refresh themselves (or wash themselves). Symbolically there is no sense that this is happening for the woman. Her life has become painful since the death of her husband and her body is letting her down. The Bath is a litmus test of what the old lady can and cannot do for herself. She has to reconcile with the fact that she might not be able to take a bath by herself anymore and would need the help of a nurse to do it. She finds this to be a humiliating thought. She feels content when she is at the cemetery but on her way back, as she comes to the world of the living, she is reminded once more of the bath and dreads the thought of the bath tub, that is like a predator, ‘waiting, waiting for a moment of inattention,’ to claim her body. It might ultimately be her grave as she would not be able to get out of it some day. The title of The Bath is significant as taking a bath is symbolic of her struggle with life. Each aspect of taking a bath is explained laboriously, to give an idea of how difficult it is for her. Not only does she realize that it is beyond her fast dwindling strength but she finds it quite humiliating to rely on somebody else, like the community nurse for help. Thanks for that insight Atiya. Why did you include the theme of connection? The old woman remains connected to both her parents and her husband. Something that is noticeable by way of the fact she visits their grave. How is the setting in the first paragraph? It highlights how laboured the woman feels. She has a load to carry. What’s one example that conveys the difficulties the woman experienced because of her old age? Perhaps the fact that she struggles to get in and out of the bath. Why is the similie that compares the bath tub to the edge with a deep drop below into the sea of the cliff so effective? It highlights the struggle that the woman encounters and how dangerous a simple thing like having a bath can be for her. This is great. Is there any chance that you analyze drama, like “Macbeth” or “A View From the Bridge”? I’m sorry but I only focus on short stories. How does frame make the story so sad. Vocab etc. I would need to look at the story again to see what elements Frame uses to make the story so sad.